The MRI Certificate program is available to Health Science (HSc) Alumni and 4th year students in Diagnostic Medical Ultrasound (DMUT), Nuclear Medicine Technology (NUMT) and Radiological Technology (RADT). The program has been designed for complete online delivery through the Dalhousie Online Web Learning (OWL) platform. Performing MRI procedures. Students are expected to become competent in all areas of MRI scanning. The theoretical component will challenge students to develop decision-making skills to optimize MRI sequences as they study MR imaging tradeoffs. Eligibility: Restricted to students in the MRI certificate program. **Venipuncture Competency (This is a non-credit requirement): Students will be required to provide proof of venipuncture competency prior to beginning Specialty Practice. Students will use this foundational skill in gaining IV injection competency during Specialty Practice. Clinical site preceptors will instruct students on the proper technique for IV insertions and help students achieve competency in IV set-up and delivery of contrast media for MRI exams. *4th year students who pursue the MRI certificate will complete courses/credit hours beyond the degree requirement. (Students in NUMT and RADT will complete 12 credit hours beyond the degree requirement and DMUT students will complete 3 credit hours beyond the degree requirement). Completion of the MRI certificate program will require students to study beyond the 4-year degree time frame. Clinical site criteria must be met as a requirement of admission. Students enrolled in the program must meet School standards regarding BLS-HCP certification and Standard First Aid. Contact health.sciences@dal.ca for further details. Please also refer to the School of Health Sciences Curriculum Framework. 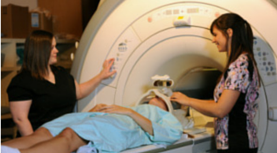 Accreditation: The Dalhousie School of Health Sciences Certificate Program in MRI is accredited by Accreditation Canada. For more information go to Accreditation Canada's website to view the list of accredited magnetic resonance imaging programs.